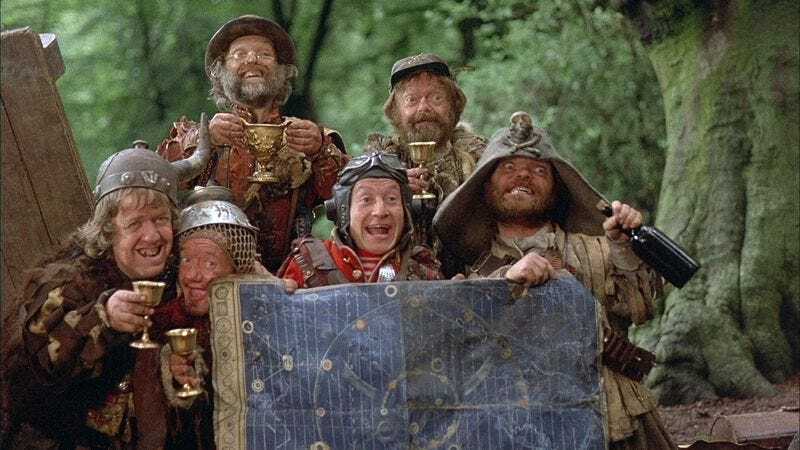 Written by Gilliam and his Monty Python cohort Michael Palin and originally released in 1981, Time Bandits tells the story of a young boy named Kevin, who gets swept up on a quest through history by a crew of bumbling, God-fleeing dwarves. The movie’s rambling, episodic nature could actually make for a pretty great TV series, with Og, Fidgit, Randall, and the all rest being pursued from era to era by the booming voice of God and hammy, would-be conqueror Evil. Which makes it all the sadder that it’ll probably never happen, because Terry Gilliam said he wants to do it, and the only thing the universe abhors more than a vacuum is Terry Gilliam getting his hopes up. But hey, The Guardian’s livechat—like most Terry Gilliam projects that actually manage to sneak their way into existence—is pretty interesting, full of the director’s reflections on his films, his battles with studios, and his time with Monty Python. It’s worth checking out, especially since a meteor is probably going to slam down on the paper’s servers any minute now to wipe it out of existence.